Call it a lucrative finale to a looney first quarter. 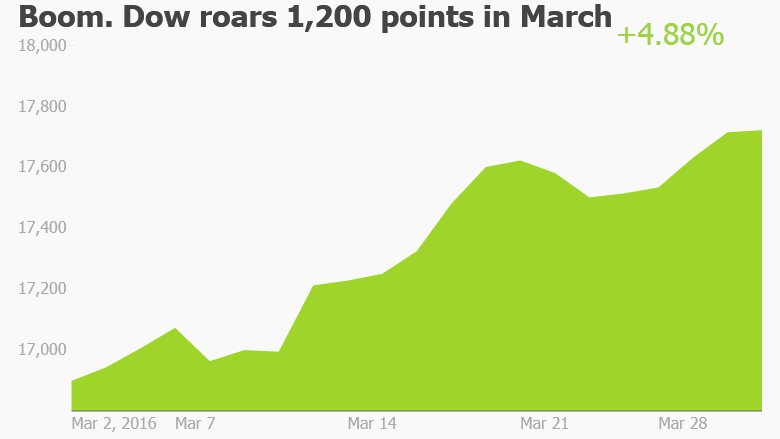 The Dow surged more than 1,200 points to new 2016 highs in March, capping off a remarkable rebound from what was the worst start to a year -- ever. 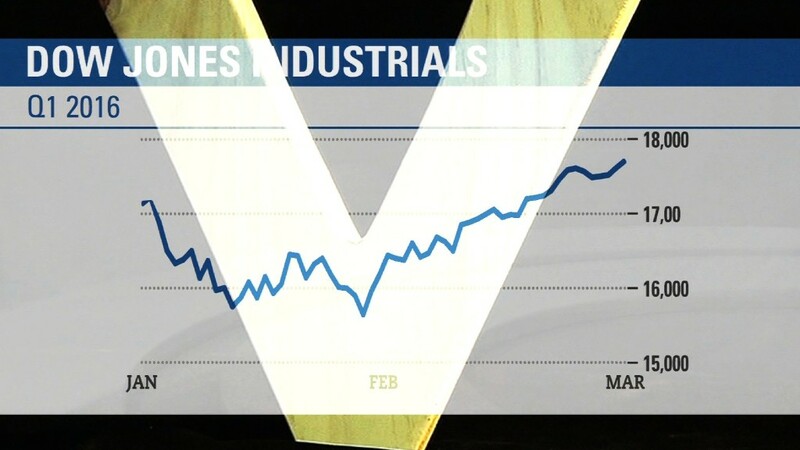 Virtually everyone capitalized on the comeback, with over 92% of investors making money in March, according to data shared exclusively with CNNMoney by investment performance tracking app Openfolio. It was the polar opposite of January when 93% of Openfolio users suffered losses. The burst of buying on Wall Street was fueled by a spike in oil prices, fading recession fears and soothing words from the Federal Reserve on rate hikes. "The end-of-the-world scenario that people were fearing has eased," said Scott Wren, senior global equity strategist at the Wells Fargo Investment Institute. "This was a fear-based, not fundamental-based, selloff." But since mid-February, the focus has shifted away from fear and back on U.S. fundamentals, which are relatively less fever inducing. The economy may not be going gangbusters, but it's also not collapsing as some suggested. "Recessionary fears were overdone," said David Lafferty, chief market strategist at Natixis Global Asset Management. "The fundamentals of the global economy haven't deterioriated. We remain in a low but positive real growth environment." That more sober outlook has driven cash back into stocks. The average Openfolio investor made nearly 6% in March. Those gains nearly wiped out the losses inflicted earlier this year. The average Openfolio user ended the first quarter with a loss of 0.8%. While the first quarter is ending on a happier note, market mayhem took investors on a rollercoaster ride that was downright scary at times. The turmoil centered on fears that China's economy was rapidly slowing down and the unknown repercussions of cheap oil. 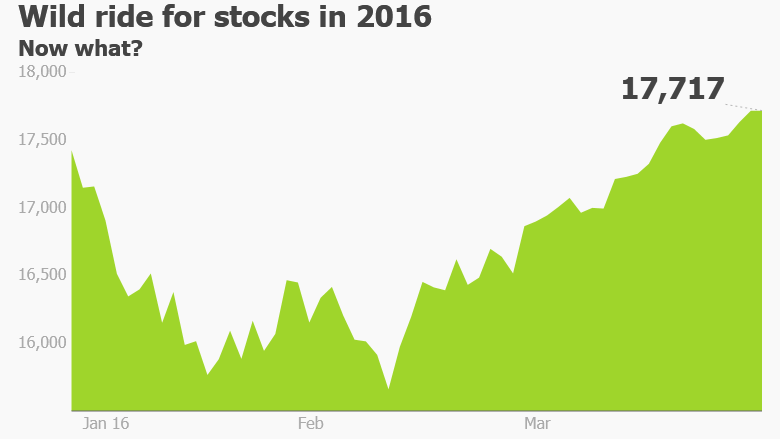 Just four trading days into 2016, the Dow was down an incredible 911 points, or more than 5%. That was the worst four-day percentage loss to start a year on records that go back to 1897. Things got so bad that the Nasdaq nearly tumbled into a bear market for the first time since the Great Recession. At one point, the Dow was down a stunning 1,974 points on the year. And CNNMoney's Fear & Greed Index was flashing "extreme fear." The VIX volatility gauge got to the highest level since August when the Dow plummeted 1,000 points. Investors got downright obsessed with the crash in oil prices and the negative side effects on jobs, emerging markets and the health of banks. The global stock market sank into a bear market on February 11 as oil plummeted to $26.05 a barrel -- the lowest level since 2003. Related: Is the stock market too hot? That proved to be a turning point. Oil not only stopped crashing, it started racing higher amid hopes that Saudi Arabia, Russia would "freeze" production to ease the epic supply glut. The oil rally from $26 a barrel to $40 lifted shares of energy companies like Chesapeake Energy (CHK), boosted banks like Wells Fargo (WFC) and fueled a rally in emerging markets like Brazil. The Fed also put investors in a better mood by abandoning plans to raise rates four times this year. Investors feared aggressive rate increases would only add to the turmoil -- and now Fed chief Janet Yellen seems to agree. But where do stocks go from here? Many observers believe the markets look "overbought" after their epic rally. Solid earnings growth will be needed to support the recent rally. And investors shouldn't expect the calmer waters to last forever. If the first quarter taught people anything, it's that volatility can emerge very quickly, seemingly out of nowhere. "We may run into some further turbulence in the days, weeks and months ahead. That turbulence is likely to bring a downshift in pricing with it," Peter Kenny, an independent market strategist, wrote in a recent note.